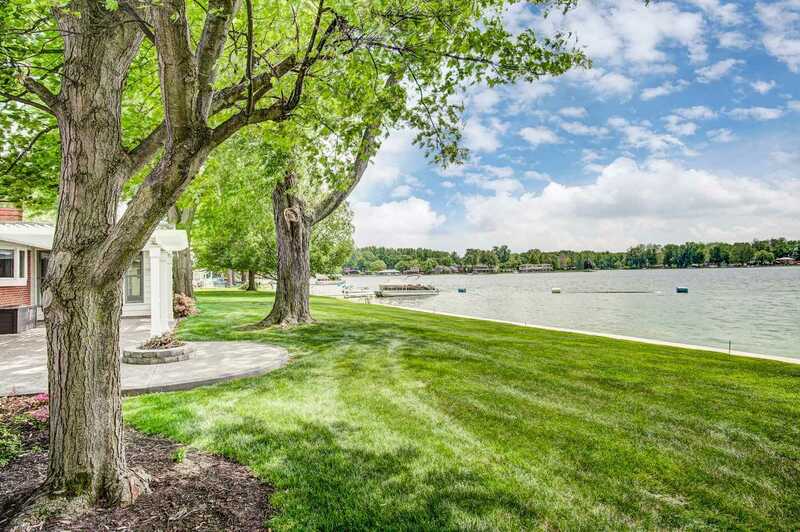 The Winona Lake lifestyle available at this stunning lakefront setting offering 100' of waterfront with impeccable views of the highly desired all sports lake. Only a short commute from the Village at Winona and the popular trails! Enjoy all that lake living has to offer with nearly 2100 sq ft in this beautiful brick ranch with modern updates throughout. Welcomed by new laminate flooring through the living room and dining area plus views of the waterfront as soon as you enter the front door! New kitchen with ample cabinetry and counter top space open to both the dining area and family room with stunning lake views and access to the backyard. A Master en suite with hardwood floors features an updated bath with tile shower. Additional bedrooms also showcase original hardwood floors. The spacious family room just off the kitchen has a gas log fireplace, built ins, nearby laundry, mudroom and half bath plus access to the lakefront sun room with panoramic views of the lake! Make the most of lake season at the custom stamped concrete patio with fire pit and pergola overlooking the yard and lake. Dock your boat at your own Hewitt pier alongside the new seawall. Additional amenities include newer furnace with heat pump, new Pella windows, stainless appliances, new water heater, o-zone water treatment system, dual tank water softener, 4â well, sprinkler system, built in speakers, 200 amp breaker box and so much more!